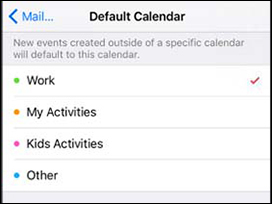 When you add a new event, it's added to your default calendar, but you can change your default calendar from your device or from iCloud.com. Refer to this support page for more info on iPhone Calendar. From the Home screen, navigate: Settings > Calendar. For iPhone 4 / 4s, navigate: Settings > Mail, Contacts, Calendars. Choose the calendar you want to be the default (e.g., Work, My Activities, etc. ).